Ok so first off if you dont know Thomas he has been producing WP plugins for a while now and has put out some really great products. He is also experienced in the IM world and has a very good understanding of what works and what does not. So when he asked me to look at his newest software I’ll admit that I was kind of excited to see what he cooked up this time. The basic of this plugin is that it allows you to pull in ANY website you want and put a click able countdown timer over the page. What this does is not only let you have any website be your sales page but more importantly it lets you add an element of scarcity to the sales page. Adding scarcity is a 100% time tested and proven method for increasing conversion rates. When people are told that they have a limited time to purchase they are much more likely to choose to purchase at that very moment. A couple of things to note about this. First is that it uses a standard IFRAME to pull in the target web page. What this means is that there is no copyright issue since the target page is not being scraped in any way. 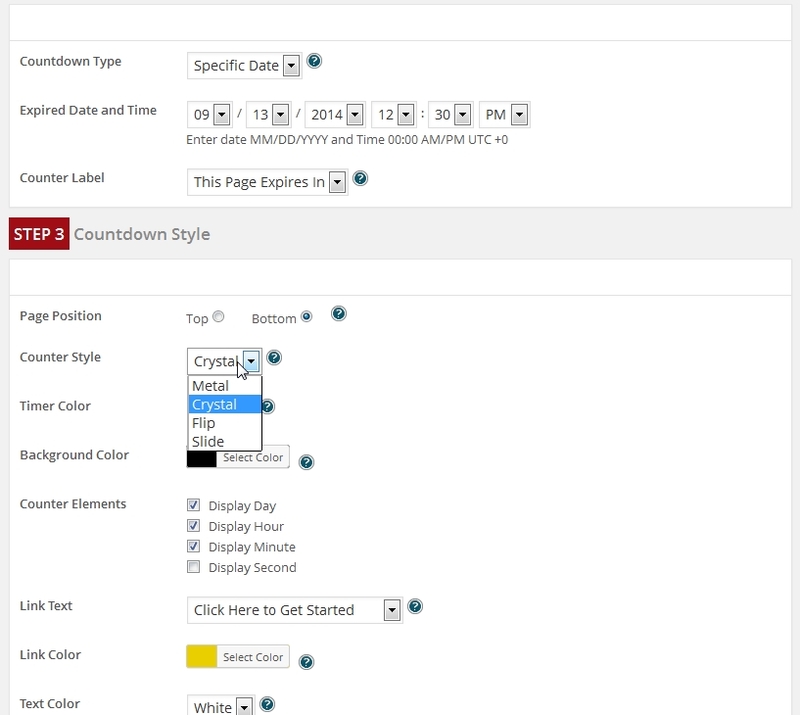 Also because it uses an IFRAME your timer bar will continue to show even if people browse around on the target site. Ok so lets take a look at the plugin itself and see how it works. The main dashboard for the Timer Bar is not very complicated. You can create an unlimited number of ‘campaigns’ which will allow you to pull in an unlimited number of sites and create an unlimited number of timer bars. Here is a test campaign that I created. As you can see a unique page is created automatically on your site for each campaign and this page is where you would direct your traffic to. From the main dashboard you are given the basic options that you would expect to create new, edit , view or delete. It also has some basic hit tracking. Now I would have liked to see an expanded tracking option that lets you see your hits by day over time, perhaps in a bar graph or something, but this does not exist. However it does have the ability to automatically track general hits and unique hits which is a very cool feature. Everyone always says that their software is easy to use. Most of the time its only easy for the guy who created the software. This is not the case with Timer Bar. I was litterly able to create my test in under 30 seconds. While there are no video tutorials for this (they really are not needed) this does have inline help. In case you dont know what inline help is, that’s where there is a little question mark next to each option that you can hover your mouse over and it will display a help pop up that explains what that particular option is for. In many ways for a software like this inline help is actually better than videos because if you have a question about what an option is for you can simply mouse over the help icon and get an instant answer. No need to switch back to the video and search around trying to find the part that talks about what you need help on. Its a nice feature that I was very glad to see that Thomas included. Also I should note that as a developer I can say that adding this kind of inline help, though it seems simple, is kind of a pain in the rear, which is the reason many product creators leave it out. Its the little things like this that are a testament to the quality of this product. When creating your bar you are given a very wide range of options to make it customizable. You can select from several types of countdowns such as countdown to a specific date, evergreen countdown (that restarts over and over once the countdown runs out), and a specific time counter (which counts for a specific amount of time). You can also change the bars color and position as well as select from some very cool number types and call to action text. A lot of times you come across a product that has a billion options, but is so complex that even after you buy it you will never use it or will never use it to its potential. Sometimes its the simple stuff built on a solid concept that proves to provide the best results. Timer Bar is exactly that. Its a simple concept, but one that is built on a very solid foundation. Being able to put your own affiliate link over any web page is awesome in itself and the timer bar lets you add a sense of scarcity to the product sale which is proven to do one thing and do it well. Increase your conversions. As a developer I often look at software in way that other people do not. Besides being a time tested concept this WordPress plug in is well writing and flows smoothly, it has all the options you need and is simple enough that you only need to devote around 30 seconds to setting it up. Its exactly what you would expect from a marketer of Thomas’s caliber. The cost is $27 and I can tell you that its a good value at that price. As many of your know for several years I worked full time a as a freelance programmer and I can say that it would cost a few hundred at least to get this plug in developed for yourself (not to mention the time cost of testing it and tweaking it). At this price point, for an easy to use plug in, based around a very solid and proven concept to increase sales and conversions, it really is a no brainier. I can see the value in this baby and as always… ‘follow your lead’! Thomas doesn’t support this timerbar plugin anymore, but it would be cool if you could add this timer functionality into your Jack Jacker Plugin. Not sure if you can, but it sure would be sweet along with allowing placement at the top or bottom of the screen.